Promotional value expires 120 days after purchase. Amount paid never expires. Appointment required. Limit 1 per person, may buy 1 additional as gift(s). Valid only for option purchased. Not valid for customers active within the past 6 month(s). All goods or services must be used by the same person. Merchant’s standard cancellation policy applies (any fees not to exceed voucher price). Merchant is solely responsible to purchasers for the care and quality of the advertised goods and services. 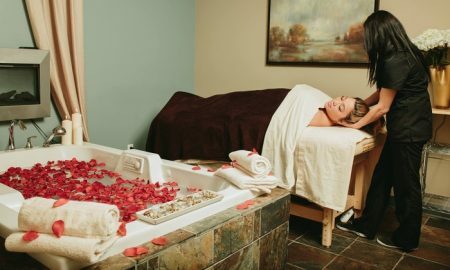 Fluid Day Spa offers more than a dozen treatments. From facial care to body treatments the full service spa delivers professional services for a soothing spa experience. As such, guests can enjoy a body balancing treatment featuring a Green Tea & Seaweed Salt Glow. The rejuvenating procedure includes warm seaweed carefully applied across the body, complete with a detoxifying clay wrap and a moisturizing seaweed body butter application. Similarly, clients can indulge in relaxing massage options to knead tension away from the body.